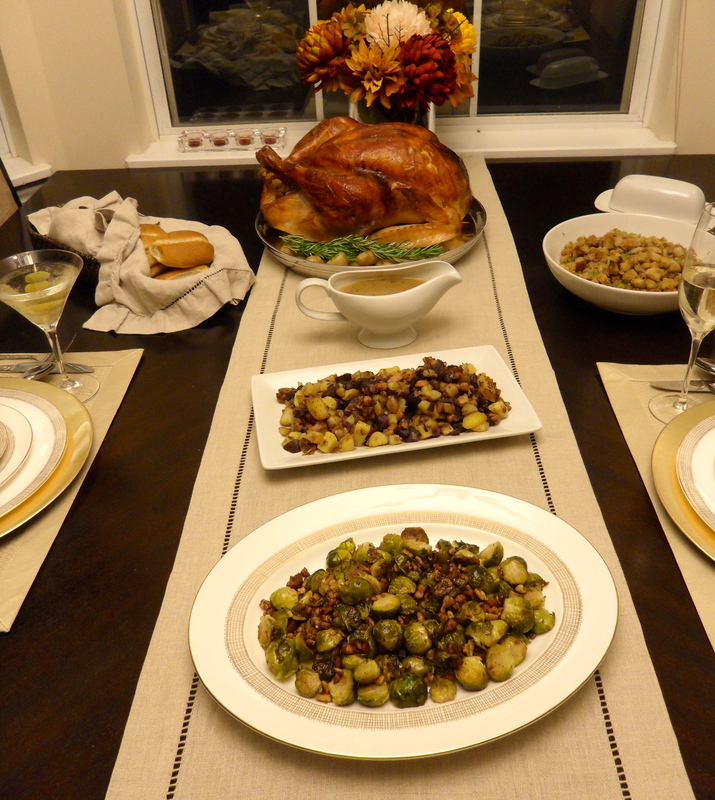 This was the “Thanksgiving 2.0” meal that I made for my husband and I the week after Thanksgiving last year. You’ve already seen posts on the Roasted Brussels Sprouts with Bacon and the Ham and Fingerling Potato Hash, so this post will focus on the Turkey, homemade stock, gravy and stuffing. I wanted to try something a little different for the turkey (last year I basted it with a lemon and rosemary infused oil) so I decided on roasting it for the first few hours with a cheesecloth that’s been soaked in butter and wine. It gives it an incredible flavor and makes the skin the crispiest I have ever had! The stuffing is the same as last year, it’s my mom’s recipe and is so delicious and a crowd favorite so no need to try anything different there! Last year I got the most emails about gravy, so I’ll give you a step-by-step way to make the perfect gravy (using homemade turkey stock that I’ll also show you how to do) and I’ll be giving you all my tips and tricks I’ve learned throughout the years! Before Thanksgiving even gets here, you need to make sure that your turkey is completely thawed, which takes a lot longer than one might think. It’s suggested to do this in your fridge as opposed to at room temperature for safety reasons… place it on a baking sheet and figure 24 hours of thaw time in the fridge for every 5 pounds of turkey. If you didn’t allow for enough time or you don’t have the space in the fridge, you can thaw it in the sink but there’s a few rules of thumb to follow. Place it in it’s original wrapping (If the original wrapping is torn, place it in another plastic bag and seal well) in your sink and fill with enough cool water to cover. You’ll have to change the water every 30 minutes and you can figure on it taking 30 minutes in the sink for every pound of turkey. Now on the day of, you’ll have a beautifully thawed turkey in either your fridge or sink, it will need to come to room temp for two hours before going in to the oven. 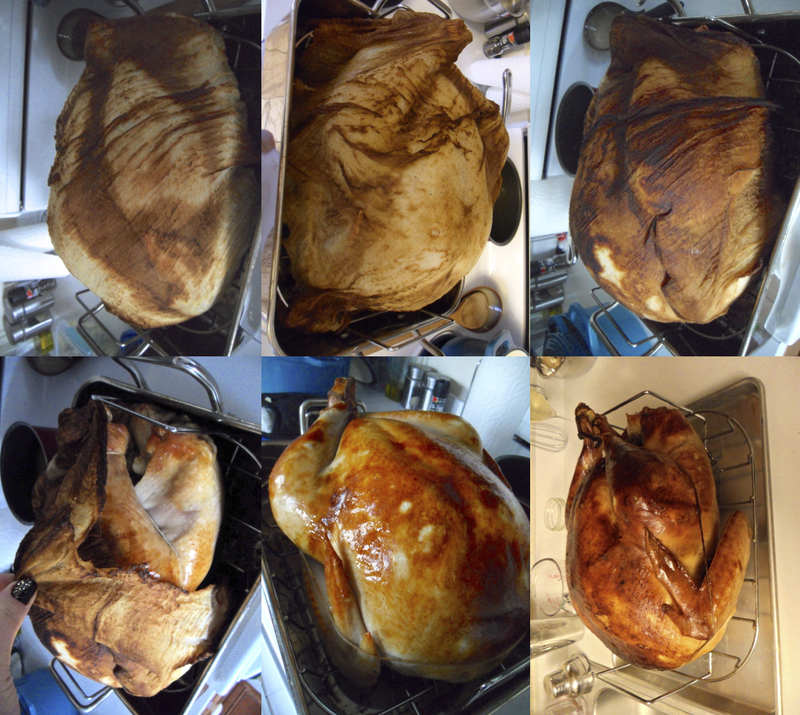 I used a 20 pound turkey and it took about four and a half total hours roasting in the oven, so if you’re trying to figure out when to start take in to account with it will take around 6.5 – 7 hours from the time you take the bird out of the fridge to when it hits the table. Most turkeys have a plastic “thermometer” that pops up when the turkey is done, but since it’s not very accurate and we’ll check the temp ourselves, I remove it. Sometime there will be plastic trussing together the legs of the turkey, we need to remove that in order to stuff the turkey later.Remove the bag of giblets and the turkey neck… keep the neck for the stock and throw away the giblets. Rinse the turkey with cold water and pat dry with paper towels, the dryer your turkey starts the more crispy the skin will get! Mix together 2 tsp of salt and 2 tsp pepper and set aside. Place rack in lowest level in the oven and preheat to 425. Tuck the wings under and set the turkey breast-side up on a clean baking sheet. While the turkey is coming to room temperature, you can make the mixture that the cheesecloth will soak in. Melt 3 sticks of unsalted butter in a small saucepan over medium heat. 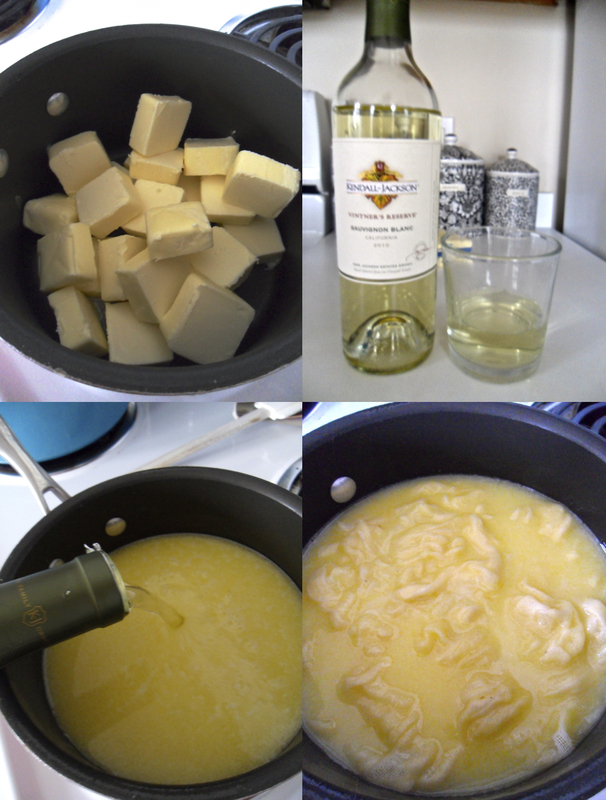 Add 1 bottle (minus 1/2 cup) of dry white wine (set the 1/2 cup aside for use in the gravy later in the day) and soak a cheesecloth in it. Now get started on your turkey stock for the gravy. Combine the turkey neck (with the membrane removed), 1 celery stalk, 1 carrot, 1 half onion, 10 black peppercorns and a bundle of parsley, rosemary and bay leaves in the dutch oven. Add 8 cups water, bring to a boil, reduce heat and simmer about 1 hour until reduced by half. 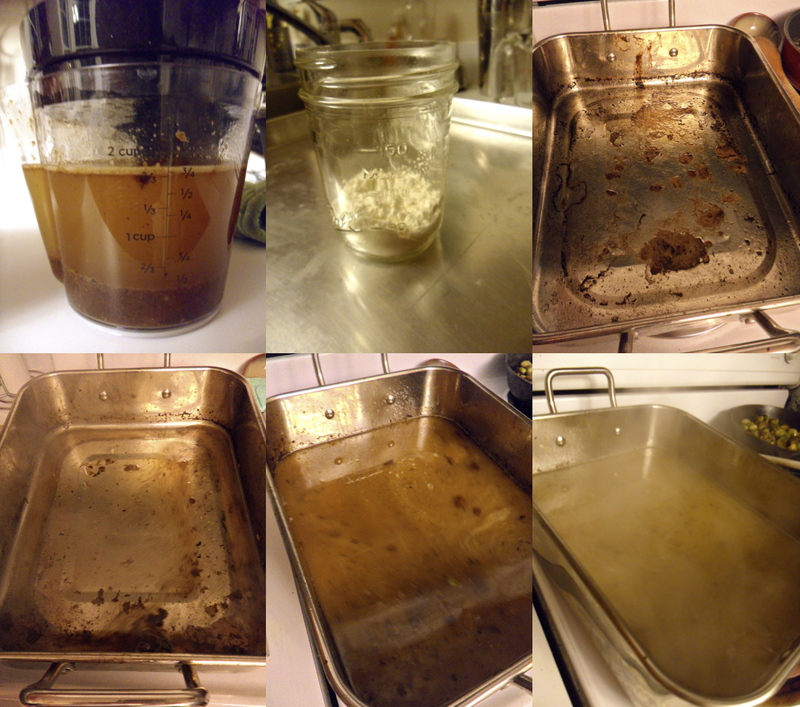 Strain and discard solids, set aside. You can also make your stuffing while you’re waiting on the turkey to come to room temperature which is great because you never want to put hot stuffing inside of an uncooked bird. Heat a skillet over medium heat with just a turn of olive oil. Add a 16 ounce package of Jimmy Dean’s original pork sausage, brown and then let cool in bowl. Add a third of a 12-16 ounch bag of premade stuffing mix and enough chicken stock to moisten. 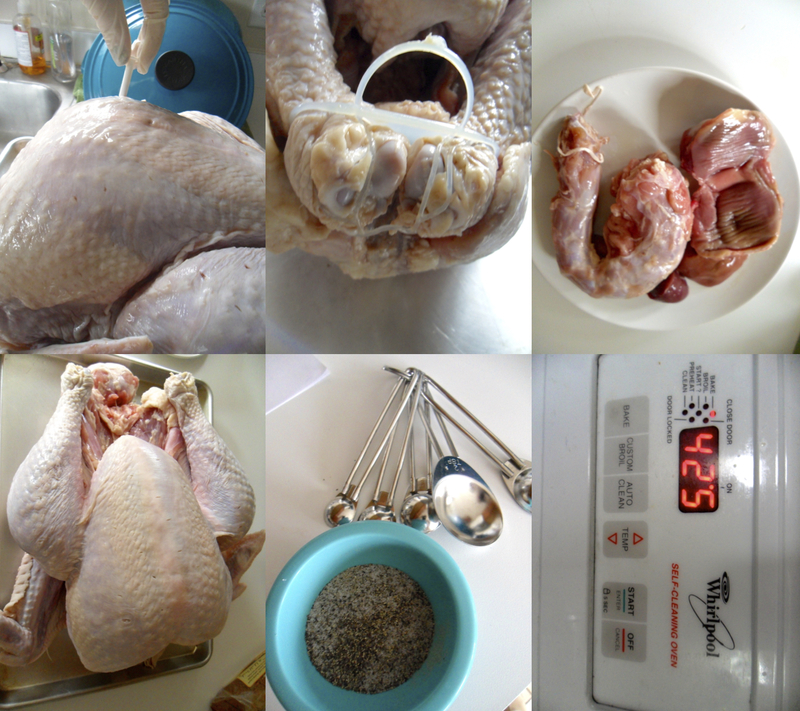 Add 1 tsp poultry seasoning and 1 tsp dried sage (or to taste). Melt 2 sticks salted butter in a skillet over medium heat and cook 1 cup diced celery and 1 chopped white onion until softened. 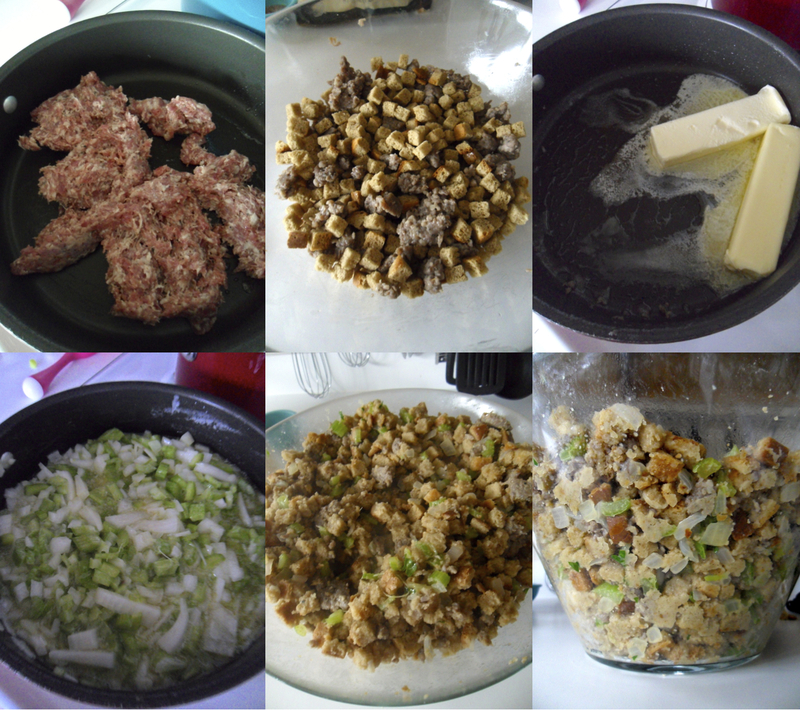 Mix in with sausage and rest of stuffing. 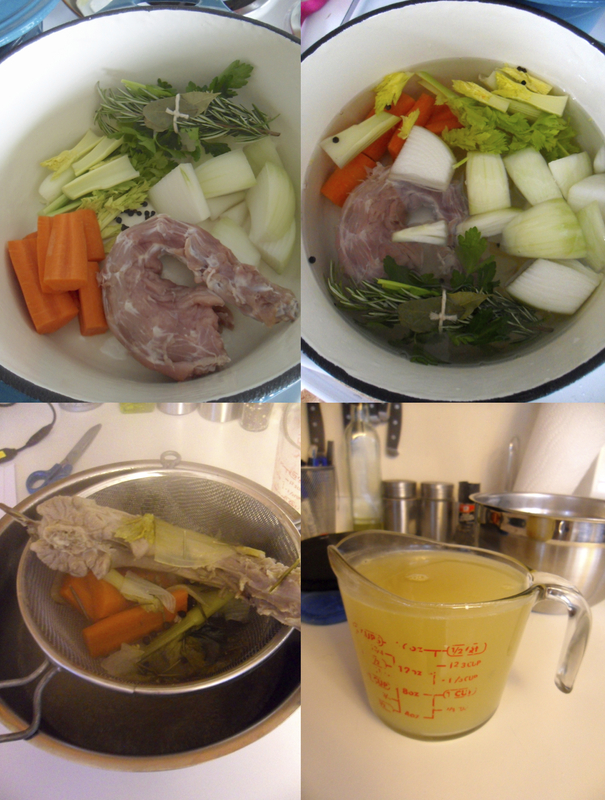 Add enough chicken stock just to moisten… it is so important not to use too much stock or your stuffing will be soggy! Once the two hours are up on your turkey and everything else is ready to go you can start stuffing it. Take the salt and pepper mixture you prepared earlier, and use some to season the inside cavity and the neck. Pack stuffing loosely in the neck (remember the stuffing will expand while in the oven so if you pack to tightly it might bust open the turkey) and secure it by pinning the neck flap in place with toothpicks. Next stuff the cavity and then secure it by putting a full truss on the turkey using kitchen twine (you can watch this videoif you don’t know how, there’s a short ad an then the video will play). Put the leftover stuffing in a casserole dish and bake it with the turkey for the last 30 minutes. Rub the turkey with 4 tbsp softened unsalted butter and season with the rest of your salt and pepper. Cover the turkey with the soaked cheesecloth (make sure you keep the leftover wine and butter mixture over low heat all day), it should cover at least the breast and part of the leg area, but if you can find a large enough one it’s great to cover the whole thing! Place turkey on a rack from a roasting pan (we have this one and I LOVE it) and then place the rack inside the pan. Put the turkey in the pan, legs first, in oven and roast 30 minutes. After 30 minutes, remove the pan from the oven, brush the cheesecloth and any exposed parts of the turkey with the wine and butter mixture and reduce oven temperature to 350 degrees. Roast for 2 hours more. Every 30 minutes, use a pastry brush to baste the cheesecloth and exposed areas of the turkey. After 2 hours, carefully remove and discard the cheesecloth being careful not to tear the skin; it will have turned quite brown. Baste the turkey with pan juices, taking care not to tear the skin, and return it to the oven. Continue roasting until the thermometer reads 165, about 1 to 2 hours more. Remember the extra stuffing needs to go in with 1/2 hour left. Once it reads 165 or within 5 degrees (the turkey will cook about another 5-10 degrees while resting) pull it out of the oven and let it rest for 15 minutes before removing the truss and the stuffing. While you’re waiting for it to rest, you can make your gravy! Pour the turkey drippings from the roasting pan into a separator and let sit for 10 minutes before pouring out. Make a slurry in the meantime by combining 1/4 cup all purpose flour with 1 cup of the homemade turkey stock in a jar and shake until no lumps are left. Set the roasting pan across 2 burners and pour in the 1/2 cup dry white wine you reserved earlier. Bring to a boil over medium high heat scrapping up the brown bits (this is where all the flavor will come from!). Whisk in slurry and remaining stock then pour in turkey juices. Bring to boil and then cook while whisking about 12 minutes more. Pour through sieve and season with salt and pepper. 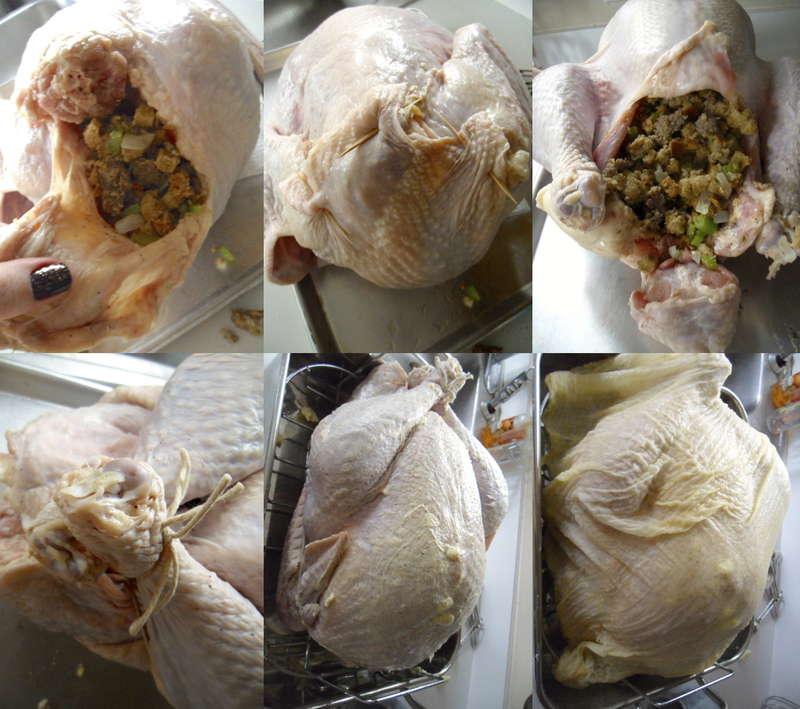 Remove the truss on your turkey, scoop out the stuffing and carve your turkey or set it out on the table whole first. I like to set mine out whole for presentation purposes, this year on a silver round tray with some fingerling potatoes and sprigs of fresh rosemary. Once you carve your turkey, sometimes it’s just inevitable that some of the light meat will be dry. I keep a pot of chicken stock simmering all day and that way you can pour a small amount over the meat to moisten it right up! 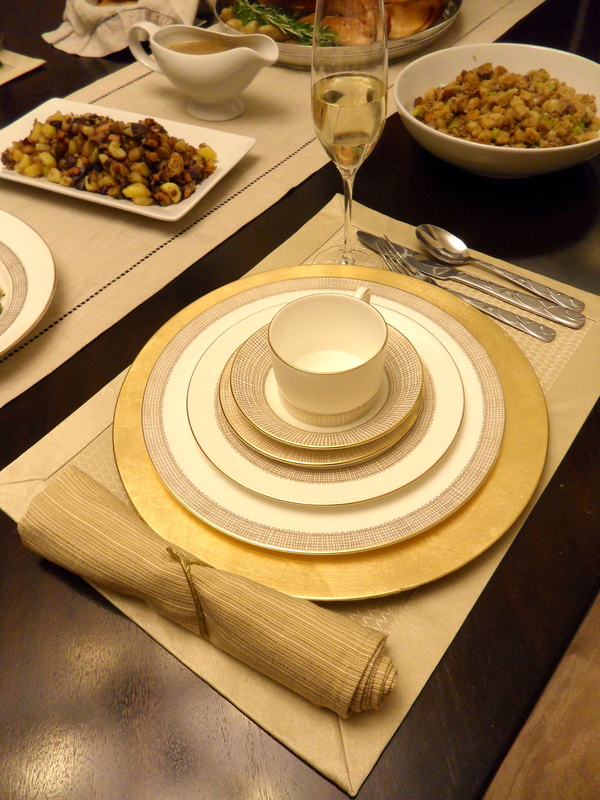 I set the table just like normal and used my DIY Wishbone Napkin Rings from last year. Everything looks so great!! I am drooling looking at the brussel sprouts! Thank you! That recipe is so easy and they are SO yummy! It’s such a wonderful time here, I love it!